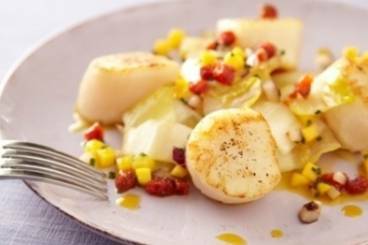 A crunchy endive salad with mango and chorizo served with pan-fried scallops. Cut the tough end from the endives, separate and wash the leaves. Pat dry and then thinly slice. Peel and finely chop the red onion. Thinly chop the chives. Peel the mango and remove the stone. Remove the skin from the chorizo and cut into small dice. Mix together the balsamic vinegar and 3/4 of the olive oil. Place the endive, chorizo, mango, red onion and chives in a bowl and then dress with the vinaigrette and salt and pepper. Heat a frying pan and add a drizzle of olive oil. Add the scallops to the pan and cook for 1 minute on each side. Serve the scallops on a bed of salad.